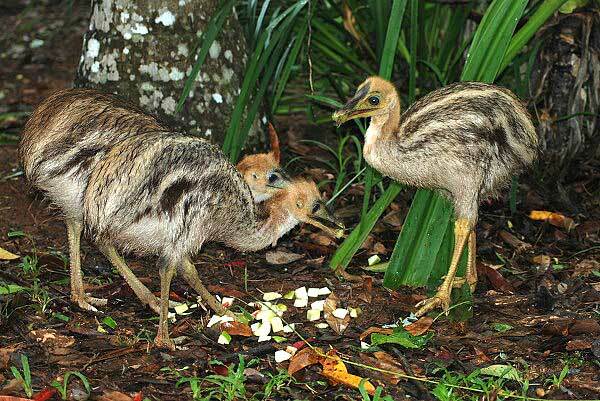 The Garners Beach Cassowary Recovery Facility now has three chicks in care. Two of these chicks came from South Mission Beach where they had been wandering alone without any father for several days. They were brought in to the Tully Veterinary Clinic for assessment where Dr Graham Lauridsen found them to be quite emaciated, but not actually suffering from any significant issues. They were they taken to Garners Beach where they have been raised and fed since November last year. The third chick was found on Etty Bay road after being hit by a car. It was cared for by a wildlife ranger overnight and brought to the Tully Veterinary Clinic for assessment. Radiographs revealed a fracture in the spine. Thankfully, the fracture was low down in the spine and, after several days of attentive care, the chick was also placed into care at Garners Beach. The three cassowary chicks are prospering and hanging out together. They have been weighed, microchipped and wormed. The chicks will stay at Garners Beach for the rest of the year and will be released back into the wild once they are big and strong enough to look after themselves. Researchers hope to track the chicks after their release using GPS technology to see where they move to and how they survive the vulnerable young adult phase of their lives. Many thanks to Rainforest Rescue which continues to provide funding for the care of the cassowary chicks and operates the recovery facility under an agreement with the Department of Environment and Heritage Protection. Money raised through the Save the Cassowary campaign goes to help keep the recovery facility working.